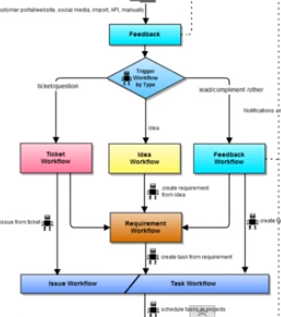 What is workflow management and automation? According to a recent article in WiseGEEK, workflow management is most commonly known as a system that enables information, documents, and tasks to pass from one employee or tool within an organization to the next. Over the last few years, and as technology evolves, workflow processes have become automated and in product development, this enables a smoother system. There are many benefits to creating product workflows and automations. More specifically, automation tools allow you and your team to create an automatic process that functions almost entirely on its own. Essentially, you have the freedom design and automate your own system for creating, responding to, prioritizing and assigning items to team members across your organization. One of the main advantages of automation tools is that it helps reduce the risk of processing errors caused by manual entries. It also improves your time management so you can focus attention on more complex tasks. Another major advantage of automation systems, is the ability to streamline customer service workflows. In today fast-paced business environment, companies need to take advantage of any tool that will allow them to provide the ultimate customer service. Customer satisfaction undoubtedly influences the success of an organization; without loyal customers to build a foundation upon, most businesses will collapse. What is workflow management with OneDesk?